Amruth HomeGarden draws strength from our age old healing traditions. Generations of our ancestors have spent their lifetime to study plants growing in their neighbourhood and to find out their healing properties for their day to day health care needs. Description: Perennial herbs, rhizomes stoloniferous ending in tubers. Leaves flat, flaccid, margins scabrous. Spikelets brownish, linear or lanceolate in simple or compound umbels, glumes pale brown, ovate, plicate. Nuts brown, obovoid, oblong. Ripe mature seeds are collected between January-April. Seeds are sown on sunken moist seed beds in April. Germination takes about 15 to 20 days and 60 to 70 percent seeds germinate. 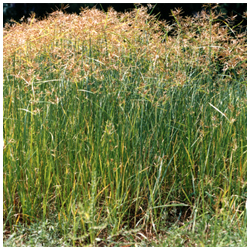 Root slips from well matured Cyprus grass are used for planting. The root slips sprout easily and are ready for harvesting in four months. Suggested Citation: B. S. Somashekhar, G. S. Goraya, D. K. Ved, Unnikrishnan P. M., Ravikumar K., Gangadharan G. G., Suma Tagadur Sureshchandra, Shilpa Naveen, Vijay Srinivas, Venugopal S. N.; Additional inputs: Soumyashree N., Sagar D. Sangale. Copyright © 2017 Foundation for Revitalisation of Local Health Traditions/TDU, Bangalore.